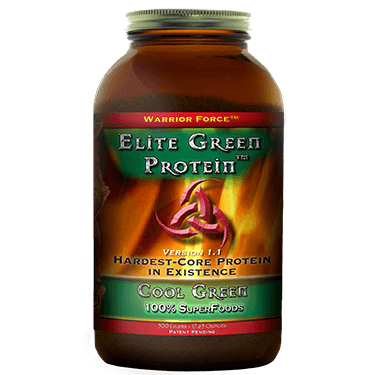 Elite Green Protein™ is completely different than any other protein. 100% raw, whole food protein sources with all of the critical cofactors still intact (vitamins, minerals, phytonutrients) that create unmatched results for workouts and for extraordinary health (with phytonutrient benefits way beyond all isolated proteins). Acid stable, and incredibly magnified/fed by the Elite Green Protein™ formula. 100% TruGanic™: TruGanic™ is Warrior Force™’s own purist, hard-core, quality standard for sourcing and production. Ingredients must pass actual tests (that no other standard requires) to verify non-GMO status and ensure they are 100% free of pesticides and irradiation. Suggested Use: This product is VERY cleansing, so start slowly with 1 teaspoon per day in water, juice, smoothie, or a meal (salad, for example). Then, increase slowly to 2 heaping tablespoons per day. This product is pure food. It will nourish your entire body in a way that only whole superfoods can. This product is Lean, Mean, and deeply Green. NO watering down. NO retreat. NO surrender. NO compromises. NO Way! Little kids and non-warriors can and do take this, and so can you! Seasoned superfood warriors find this a tasty treat. Other warriors will master it in time. Alcohol is an acquired taste and Elite Green Protein™ tastes WAY better than alcohol. Easy to take in juice. No excuses. Are You Warrior Enough? 100% TruGanic™. TruGanic™ is Warrior Force™’s own purist, hard-core, quality standard for sourcing and production. Ingredients must pass actual tests (that no other standard requires) to verify non-GMO status and ensure they are 100% free of pesticides and irradiation. © 2016 The Vegan Trainer | All rights reserved. | Designed by thelogonom.